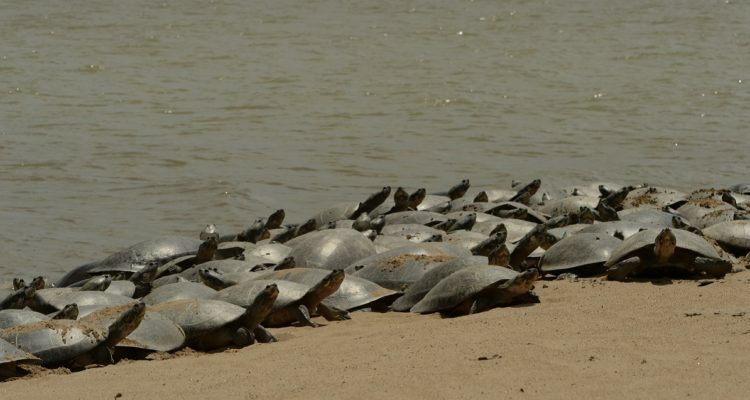 Fondation Segré joined forces with the Turtle Survival Alliance (TSA) for the protection of the Giant South American river turtle (Podocnemis expansa). The species occurs over a vast area drained by the Orinoco and Amazon rivers, across eight countries. It is at the margins of these rivers that humans have settled, making the species a valuable source of food and income. However, a continued unsustainable harvest and commercialization of eggs and meat has resulted in depleted populations. In the Orinoco region of Colombia, the TSA recently identified the second largest known population of the species in the country in the middle Meta River (La Virgen), the largest one occurring outside the Amazon watershed. A community conservation program was started by TSA in 2014 in and Fondation Segré has decided to step in to guarantee its continuation and consolidation. This project aims to work with the community of La Virgen for the protection of the species through community-based protection of reproductive females and nests, the implementation of a program for the sustainable use of turtle eggs by the community, and a strong environmental education program aimed at reducing adult female consumption in nearby settlements.